We used to say in my profession — public relations — that you shouldn’t say or write anything that you wouldn’t want to turn up on the front page of the New York Times. Now what I like to tell clients instead is: You shouldn’t say or write anything that you wouldn’t want to turn up in Google search results. After all, it’s a lot more likely that your communications will be reported, indexed, archived, and made discoverable online than appear on the front page of the Times. “So what?” some will say. Despite diminishing newspaper readership, the New York Times still maintains a broader readership — and has more influence on the news agenda — than people making Google queries. Though this is still true, the Internet has become a veritable “permanent record” where stories and online conversations can be exhumed much more easily than when you had to dig through old microfiche. Companies that are going to be successful...won't be those determined to 'demonstrate transparency' so much as those that resolve to simply 'be transparent.'" The old rule was really about discretion. PR professionals must constantly consider how even their most seemingly inconsequential statements can be interpreted, contextualized (or de-contextualized), and publicized to unintended audiences. In a profession that encourages out-of-the-box thinking, it’s a good and useful rule. But in the digital media era, it’s a bit outdated. In this new age, it’s dead simple for consumers to read on-demand reviews of your product, for legislative staffers to query your public policy issue before recommending a vote, for advocacy groups to examine your organization’s track record relative to their cause, and for investigative journalists (some, yes, from the New York Times) to research your company for a story or crowdsource public discussion of your organization online. In these ways and more, the online search environment has become both an indicator and an influencer of an organization’s offline reputation. What’s more, the online environment is much less wieldy for us PR folks. Gone are the days of “command-and-control” style messaging and, frankly, good riddance. The ceding of message control, and the need for professional communicators to be nimble in the new age of co-creation, warrants a separate post unto itself. Suffice it to say: The timeless value of discretion is made more valuable — and often more tricky — when the new nature of media requires communicators to be rapidly and ubiquitously responsive. I don’t think it’s entirely a coincidence that, at a time when new media technologies are changing the rules of journalism, companies are placing a new emphasis on transparency. Access to, and distribution of, information is being rapidly democratized and smart companies know to get out ahead of this trend. However, as with many corporate buzzwords (e.g., “quality” and “innovation”), the concept is suffering from inflation as too many companies claim “transparency” as part of their identity without really walking the talk. 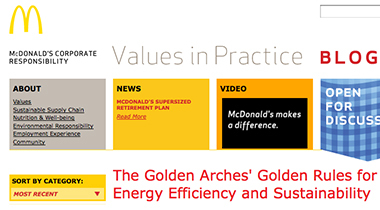 On the McDonald’s CSR blog, the company’s VP of corporate social responsibility writes, “Credibility is only achieved if you get things done, demonstrate transparency, highlight challenges and opportunities…” The quote indicates that McDonald’s recognizes that it operates in a trust economy where credibility is a form of currency. But it also indicates that the company uses transparency as a tactic, as a mere means to achieving credibility. Companies that are successful in this new media environment won’t be those determined to “demonstrate transparency” as much as those that resolve to simply “be transparent.” Put differently, transparency won’t be what they communicate but how they communicate. “Radical forms of transparency are now the norm at startups — and even some Fortune 500 companies. It is a strange and abrupt reversal of corporate values. Not long ago, the only public statements a company ever made were professionally written press releases and the rare, stage-managed speech by the CEO. Now firms spill information in torrents, posting internal memos and strategy goals, letting everyone from the top dog to shop-floor workers blog publicly about what their firm is doing right — and wrong. To be sure, this is a complex topic and there are practical limits on what can be communicated transparently. In his corporate blog, Oracle vice president Frank Buytendijk thoughtfully points out that a system of “perfect transparency” would reveal competitive secrets, reduce profitability and inflate consumer expectations. More on topic, he notes that large companies that position themselves as transparent would face even steeper consequences to their reputations if, for example, an accounting irregularity in a regional office surfaced. I’d argue that this is a minor casualty compared to the trust and goodwill a company gains by making transparency integral to its operation. Before long, it won’t simply be the case that you shouldn’t simply write or say anything you wouldn’t want discovered in the New York Times or online. Instead, in an effort to attain the kind of transparency that is obligatory in a new era of citizen journalism, a new standard will emerge whereby organizations will be compelled not to do anything they wouldn’t want discovered. The organizations that will be truly successful in this environment are those that have integrated transparency as part of their organizational culture and not just their communications strategy. To the extent that the two are inter-related, the communications strategist has a substantial role to play here. 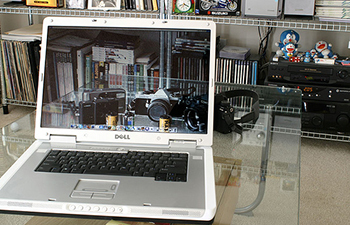 Transparent laptop photo by Brian Kim via Flickr. great post. easier said than done though with so many PR firm CEOs who don’t even have transparency in their vocabulary. btw, the dark background and black text makes it difficult to read. Could there come a time when corporations and governments are so transparent, they don’t try to delegate or screen their public communications? When there are no public relations experts? No more managing perception, just honesty? We can dream. disregard note abt. layout. it looks perfect now. something’s wrong with my screen. The critical difference between creating an environment and living in that environment – demonstrating transparency vs being transparent – is going to be a prime mover IMO in getting companies to truly BE the things they say they are. While I’m old enough to appreciate the value of editors at old media, I am excited to see if this brave new world of multi-party communication (as opposed to corporate dictums) creates more enlightened corporate interests…or just more spin. Big issue is going to be HOW they control that transparency and the ensuing communication of it. With the censor it? Slow it down? Speed it up? Interesting point you are making. Great post. I think the real struggle with transparency is to what degree companies embrace and execute engagement with key stakeholders. Most companies flinch when recommendations are made to make companies more transparent (even through internal communications). In my experience, it is the fear of constantly being reactive and perceived greater risk of dissemination of proprietary information that causes companies to fall short. Time, resources and management of such activities also prohibits companies from moving forward because there is always an internal debate over who or what department should be managing such initiatives. Mark, great post. I think that, for large organizations especially, the greatest challenge will be how to create/evolve social media/web2.0 communication policies and strategies, when the landscape is changing so quickly and the potential ‘downside’ from a misstep is so great. I think you’ll see the U.S. Government in particular struggle with this question in the coming months. Interesting. In some ways, I see it like this: Today, I know everyone has an agenda. The media, companies, people I know. Having an agenda isn’t the problem. To me, transparency is, I just want to know what your agenda is and know you are not manipulating me with your information. It can be that simple.